Rainstorms sweeping across parts of China have affected millions, and Sichuan province has been hit the hardest by severe floods and landslides. The train station at Mount Qingcheng, Sichuan, was inundated on Tuesday morning, said Liu Huiying, a tourist from Beijing. "The water level was so high that it was up to my knee," she said. Rainstorms in Dujiangyan, near Mount Qingcheng, caused flooding in urban and landslides in mountainous areas. An expressway linking Dujiangyan with Chengdu was closed. Wan Hong, owner of Hongyuan Inn near Mount Qingcheng, said the rainstorm was the heaviest he had ever seen. The storms caused some farmers' houses to collapse and flooded a road from Dujiangyan to Mount Qingcheng. "All 24 trains between Mount Qingcheng and Chengdu were cancelled on Tuesday," said Xia Yongjing, an information officer with the Chengdu Railway Bureau. Heavy rains flooded the ruins of the old county seat of Sichuan's Beichuan Qiang autonomous county, which was ravaged by the magnitude-8 Wenchuan earthquake in 2008. Some 20,000 people died in the quake in Beichuan, which is China's only Qiang autonomous county. "It is the biggest rainstorm in 50 years in the county. The deepest water in the ruins is 7 meters. The rainstorm has affected 15 townships and 42,571 people in Beichuan. While the county has evacuated 2,019 residents as a precaution, one person is missing, many roads and bridges have been damaged, and power and telecommunication facilities have been cut off. Direct economic losses have surpassed 88 million yuan ($14 million)," said Wang Shoulei, an information officer in Beichuan. 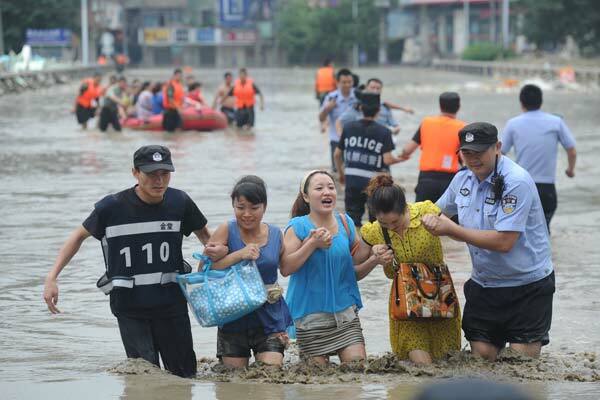 Floods affected 16,900 people in Ya'an, with direct economic losses estimated at 768 million yuan. The pandas at the Bifengxia base of the Wolong Nature Reserve in Ya'an were safe. "The mountainous base is 1,100 to 1,200 meters above sea level and the rainstorm has had a minimal impact on it," said Zhang Guiquan, a panda expert at the base. "Before the flood season, the base initiated an emergency response system against possible rainstorms. When the rainstorm hit Ya'an, keepers recalled all pandas playing outside the dens," he said. Wolong has some 170 captive pandas and more than 80 are in its Bifengxia base in Ya'an. More than 200 flights at Shuangliu International Airport in Chengdu were cancelled because of the severe weather, said Lu Junming, an airport information officer. "Some of the inbound flights had to land in airports in Mianyang and Nanchong in Sichuan, Xi'an in Shaanxi province, Guiyang in Guizhou province and Lanzhou in Gansu province," he said. In Chengdu, food prices rose because of the rainstorms. At produce market near Shuhan Road, a kilogram of tomatoes sold for 9 yuan, four yuan more than normal, and blanched garlic went for 18 yuan, a 2 yuan hike. "Fewer farmers have sent vegetables to the city because of the rainstorm," said vendor Xia Bi. The Sichuan Provincial Meteorological Center has upgraded its orange rainstorm alert to red, as more rain is expected in Dujiangyan, Beichuan, Ya'an and Wenchuan over the next three days. In neighboring Gansu province, three villagers remain missing after falling into floodwaters on Monday evening. Search and rescue efforts are underway, according to Xinhua News Agency. Authorities in Gansu's Longnan issued a yellow alert for heavy rain early on Tuesday, as storms have been pounding the city since early on Monday. Local authorities also warned of the risk of potential geological disasters, Xinhua said.